The Spaniards built 14 lighthouse beacons in Puerto Rico, to light the way of approaching ships. The climb to the top, when permitted, allows a vast view of the entire panoramic coast. Almost half of the original lighthouses are still in use and light the shore for incoming ships. This lighthouse is managed by the Conservation Trust of Puerto Rico. This is the Las Cabezas de San Juan Nature Reserve. This 19th century working lighthouse "El Faro" has been restored to its original neoclassical design and is the second oldest on the island. On a clear day you can see the Caribbean islands. The El Morro Fortress was building in 1539. 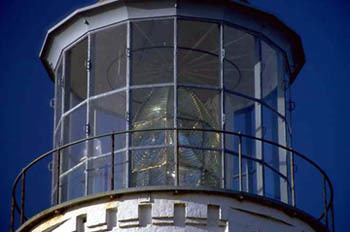 The first lighthouse was constructed in 1846 and has been reconstructed 3 times since. During the Spanish-American War the tower was hit by mortar. It now stands reconstructed of salvaged bricks and still guides ships entering the San Juan Harbor. the most beautiful of the lighthouses and it was built in 1881. The lighthouse of Cabo Rojo sets on a cliff of limestone, some 200 feet above the ocean. The lighthouse is now operated electrically. The Lighthouse of Punta Mulas was built of stone in 1896 on the Island of Vieques. The reflector was imported from France and can be seen for some 16 miles. The Lighthouse of Maunabo is located on Punta Tuna, near the charming town of Maunabo. The Spaniards built this lighthouse in 1893.
and uses an electric 26,000 candlepower rotating beacon. The Punta Borinquen Lighthouse of Aguadilla was built in 1870 and has been designated an historic site by the National Register of Historic Places. The Caja de Muerto Lighthouse is located off the Ponce shore on "coffin Island." 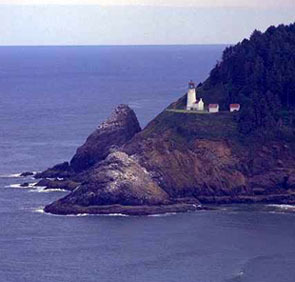 This lighthouse has been fully restored by the Department of Natural Resources. The Lighthouse Caja de Muerto is a museum and a look-out.